Tech giants Apple and Qualcomm have settled a lawsuit over Qualcomm's modem chips used in Apple products. SAN DIEGO (CNS) - As opening statements were beginning in the San Diego federal trial of a long-standing patent dispute, technology giants Apple and Qualcomm announced a worldwide legal settlement Tuesday, along with a six-year licensing agreement. Following Tuesday's announcement, Qualcomm stock jumped 23 percent, closing at $70.45. Apple stock increased by 2 cents to $199.25. "Qualcomm and Apple today announced an agreement to dismiss all litigation between the two companies worldwide," according to a joint statement issued by the companies. "The settlement includes a payment from Apple to Qualcomm. The companies also have reached a six-year license agreement, effective as of April 1, 2019, including a two-year option to extend, and a multiyear chipset supply agreement." Apple had been seeking billions of dollars over what it claims are exorbitant fees Qualcomm allegedly charged for the use of Qualcomm chips in iPhones, while Qualcomm alleged that Apple breached its licensing agreements to use Qualcomm's intellectual property by refusing to pay billions in fairly charged royalties. Apple has long accused Qualcomm of charging excessive royalties for the licensed use of Qualcomm's technologies in iPhones, with Apple alleging that Qualcomm's licensing policies are monopolistic and allow it to force phone manufacturers into unfair agreements. In its federal lawsuit in San Diego, Apple alleged that Qualcomm "illegally double dips" by forcing companies to pay for a license to use Qualcomm patents as well as purchasing the technology itself. According to Apple, this allowed Qualcomm to leverage "its market power to extract exorbitant royalties" and the company later only agrees to lower the royalty rates "in exchange for additional anticompetitive advantages and restrictions on challenging Qualcomm's power, further solidifying its stranglehold on the industry." Apple also claimed that Qualcomm has withheld around $1 billion in rebates it was supposed to pay Apple as reimbursement for the patent royalties. Qualcomm alleged Apple breached its agreements "for the express purpose of inflicting financial harm on Qualcomm and coercing Qualcomm to accept unfair compensation for its IP," according to Qualcomm's trial brief. 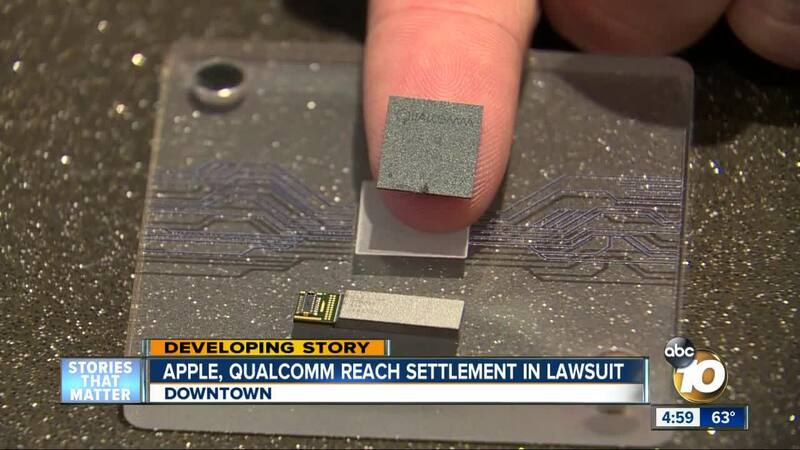 The chip supplier also stated that Apple has benefited tremendously from the use of Qualcomm's IP, yet it claimed Qualcomm's policies have harmed the company. Qualcomm denied that its licensing practices were anti-competitive and stated that its policies "have been standard in the cellular industry since its inception" and its royalty rates "have been accepted by hundreds of licensees."